ROMEOVILLE, Ill.-The host Lewis Flyers came out on fire to start the second half and turned a four-point deficit into to a 13-point lead just six and a half minutes into the final period before holding off the No. 3 Bellarmine Knights for a 65-61 upset on Thursday night in a Great Lakes Valley Conference game at Neil Carey Arena. 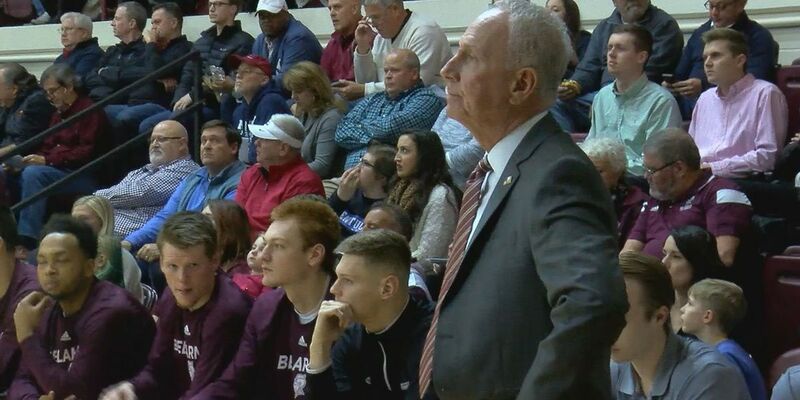 Trailing 31-27 at halftime, the Flyers came out and hit their first six 3-pointers in the second period while the Knights missed 10 of their first 12 shots over the same period as Lewis pulled ahead 48-35 at the 13:12 mark.Bellarmine’s Chivarsky Corbett finally found the range and hit three 3-pointers to help the Knights mount a comeback. Bellarmine’s offense also had problems. Coming into the game as the top shooting team in the country, the Knights made just 39 percent of their shots against Lewis including a 7-for-28 night (25%) from beyond the arc.Conversely, Lewis finished with 47.2 percent shooting after opening the game by missing their first seven shots. They also finished a respectable 8-of-19 from 3-point land for 42.1 percent after making just one of seven in the first half.Compounding the shooting woes for the Knights was the fact that Lewis beat them on the backboards as well, outrebounding Bellarmine 37-33. Tonight’s game marked the first time this season that Daniel Ramser and Adam Eberhard were not in the starting lineup as both are nursing injuries. While Ramser did not play the entire game, Eberhard finished with 12 points in 25 minutes of action.Corbett paced the Knights’ offense pumping in 20 points and claiming seven rebounds with Alex Cook adding 14 points and hauling in eight boards. Parker Chitty dished out five of Bellarmine’s 16 assists and hit a pair of treys for six points. Adam Pischke led the Lewis second half charge and finished with 20 points, which included a 4-for-6 night from the 3-point line. Delaney Blalock turned in a double-double for the Flyers with 15 points and 11 rebounds while Kendale McCullum handed out nine assists.The loss was Bellarmine’s second consecutive in regular season GLVC play-something that hadn’t occurred since the 2013-14 season. The Knights slip to 18-2 overall and 9-2 in league play while the Flyers improve to 16-4, 8-3 GLVC.Next up for Bellarmine is another tough road test as the Knights play at Indianapolis on Saturday night at 7:30 p.m. The Greyhounds are 15-6 and 8-3 on season following a loss to Southern Indiana on Thursday night.